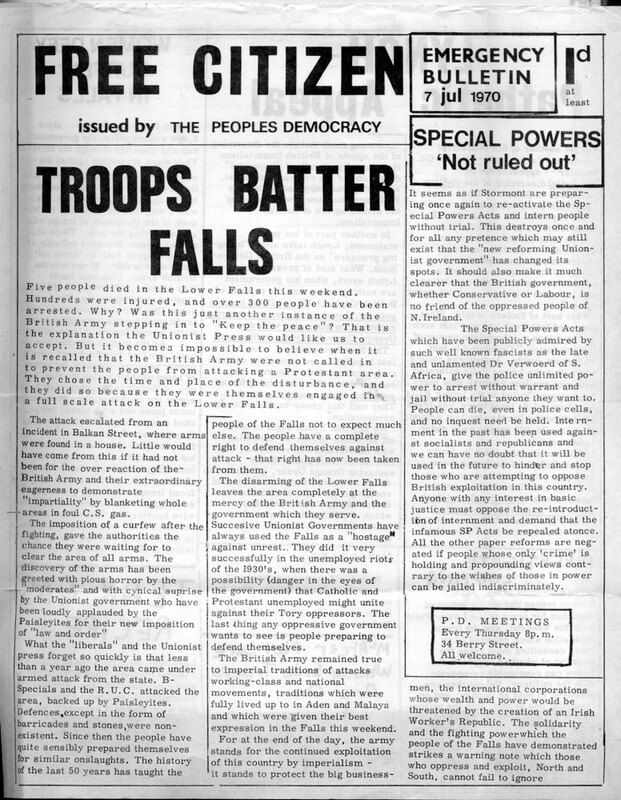 The Falls Curfew, also called the Battle of the Falls (or Lower Falls), was a British Army operation during 3–5 July 1970 in the Falls district of Belfast, Northern Ireland. The operation began as a search for weapons in the staunchly Irish nationalist district. As the search ended, local youths attacked the British soldiers with stones and petrol bombs and the soldiers responded with CS gas. This quickly developed into gun battles between British soldiers and the Irish Republican Army (IRA). After four hours of continuous clashes, the British commander sealed off the area, which comprised 3,000 homes, and imposed a curfew which would last for 36 hours. Thousands of British troops moved into the curfew zone and carried out house-to-house searches for weapons, while coming under intermittent attack from the IRA and rioters. The searches caused much destruction, and a large amount of CS gas was fired into the area. Many residents complained of suffering abuse at the hands of the soldiers. On 5 July, the curfew was brought to an end when thousands of women and children from Andersonstown marched into the curfew zone with food and groceries for the locals. Large number of IRA weapons captured. Curfew broken by neighbouring residents. During the operation, four civilians were killed by the British Army, at least 78 people were wounded and 337 were arrested. Eighteen soldiers were also wounded. Large quantities of weapons and ammunition were captured. The British Army admitted afterwards that some of its soldiers had been involved in looting. The Falls Curfew was a turning point in the Troubles. It is seen as having turned many Catholics/Irish nationalists against the British Army and having boosted support for the IRA. The Northern Ireland riots of August 1969 marked the beginning of the Troubles. In Belfast, Catholic Irish nationalists clashed with Protestant Ulster loyalists and the mainly-Protestant Royal Ulster Constabulary (RUC), Northern Ireland’s police force. Hundreds of Catholic homes and businesses were burnt out and more than 1,000 families, mostly Catholics, were forced to flee. The rioting ended with Operation Banner, the deployment of British troops. In December 1969, the IRA split into the 'Official' IRA and 'Provisional' IRA, with the 'Provisionals' promising to defend Catholic areas. A week before the Falls Curfew, on Saturday 27 June 1970, there was severe rioting in Belfast following marches by the Protestant/unionist Orange Order. At the Short Strand, a Catholic enclave in a Protestant part of the city, the Provisional IRA fought a five-hour gun battle with loyalists (see Battle of St Matthew's). Three people were killed and the loyalists withdrew. The Provisional IRA presented itself as having successfully defended a vulnerable Catholic enclave from armed loyalist mobs. As the search ended and the troops began to leave, a crowd of youths on Raglan Street tried to block their path and pelted them with stones. The troops replied by launching CS gas at the crowd. The youths continued to throw stones and the soldiers responded with more CS gas. According to a local republican: "it being the week after Short Strand... they were angry that the Army was going to disarm their only means of defence". Shooting and rioting continued for a number of hours after the curfew began. Minutes after the curfew was announced, three soldiers were shot and wounded by Official IRA volunteers in Omar Street. Troops also reported coming under "heavy and extremely accurate sniper fire" in Plevna Street. Billy McKee, commander of the Provisional IRA's Belfast Brigade, telephoned Jim Sullivan and offered help, but Sullivan rejected the offer. The small Provisional IRA unit in the area decided to engage the troops nevertheless. It consisted of up to 11 volunteers commanded by Charles 'Charlie' Hughes. They fought a gun battle with troops in Cyprus Street before withdrawing. According to Brendan Hughes, the unit ran out of ammunition. Martin Dillon wrote that by withdrawing, they "avoided losing what few weapons they had in a confrontation which could only end in disaster". Outside the curfew zone, Springfield Road Army/RUC base came under sustained attack from missile-throwing crowds. Soldiers pushed them back with CS gas and baton charges, but IRA snipers moved in and kept the base under intermittent fire. The last shots were fired at dawn on Saturday 4 July. Inside the curfew zone, the British Army began a house-to-house search for weapons and demolished barricades and made arrests. At least 1,000 houses were searched. Any journalists who remained inside the curfew zone were arrested by the British Army. It is claimed that because the media was unable to watch their activities, the soldiers behaved "with reckless abandon". British Army log sheets reveal that the troops were ordered to "be aggressive". Hundreds of houses were forcibly searched and there were scores of complaints of soldiers hitting, threatening, insulting and humiliating residents. Pubs and businesses were also searched and it is claimed that several of them were looted by the soldiers. According to Mallie and Bishop's account: "The soldiers behaved with a new harshness... axeing down doors, ripping up floorboards, disembowelling chairs, sofas, beds, and smashing the garish plaster statues of the Madonna... which adorned the tiny front parlours". At a Northern Ireland Cabinet meeting on 7 July, it was said that "little structural damage had been reported, apart from the pulling up of floorboards". The ministers concluded that there was a "smear campaign" being mounted against the British Army. The British Minister of State for defence, Lord Balniel, defended the actions of the soldiers: "I am deeply impressed by the impartial way they are carrying out an extremely difficult task". William Burns, a 54-year-old Catholic civilian, was shot dead, likely from a ricochet, at the front door of his home on the Falls Road on 3 July. He had just finished chatting to a neighbour when he was shot in the chest. The shooting took place at about 8:20pm, almost two hours before the curfew was announced. A pathologist said that the bullet had likely been a ricochet. The Falls Curfew was a turning point in the relationship between the British Army and the Irish nationalist/Catholic community. Historian Richard English wrote that it was "arguably decisive in terms of worsening the relationship between the British Army and the Catholic working class". Previously, many of them had seen the British Army as a neutral force in the city that would protect them from the police. However, the events of the Falls Curfew gave credence to the Irish republican argument that the British Army was a hostile colonial army of occupation. According to Sinn Féin's Gerry Adams, "Thousands of people who had never been republicans now gave their active support to the IRA; others, who had never had any time for physical force now regarded it as a practical necessity". Another result of the Falls Curfew was a deepening of the enmity between the two factions of the Irish Republican Army, the 'Official' IRA and the 'Provisional' IRA, who had parted ways in December 1969. The Officials accused the Provisionals of tricking them into a fight they could not win and then leaving them to fight alone, resulting in the loss of much of their weaponry. Over the following year, the two factions carried out many shootings and beatings of each other's members. A truce was eventually agreed between them to prevent further bloodshed after the Officials assassinated a young Provisional named Charlie Hughes. Hughes was the commander of the Provisional's unit in the Lower Falls and had taken part in some of the fighting during the Curfew. ^ Kirkaldy, John (1986). Yonah Alexander & Alan O'Day, ed. Ireland's Terrorist Dilemma. Martinus Nijhoff Publishers. p. 120. ^ Shanahan, Timothy (2009). The Provisional Irish Republican Army and the morality of terrorism. Edinburgh University Press, pp. 24–25. ^ Barry McCaffrey (25 June 2010). "Battle of Short Strand". The Irish News. pp. 14–17. ^ a b c d e f g h i j k Dillon, Martin (1999). The Dirty War: Covert strategies and tactics used in political conflicts. Taylor & Francis. pp. 212–213. ^ a b c d e f g h i j k l Marie Louise McCrory (30 June 2010). "Falls Road Curfew – 40th Anniversary". The Irish News. pp. 12–15. ^ Chibnall, Steve (2003). Law and Order News: An analysis of crime reporting in the British press. Routledge. pp. 176–177. ^ Rafferty, Oliver (1994). Catholicism in Ulster 1603–1983: An interpretative history. University of South Carolina Press. p. 265. ^ Fraser, T G (2000). Ireland in conflict, 1922–1998. Routledge. p. 50. ^ Moloney, Ed. "Gerry Adams and me ". The Times. 28 March 2010. ^ a b English, Richard (2004). Armed struggle: the history of the IRA. Oxford University Press US. p. 136. ^ Taylor, Peter (1997). Provos: The IRA & Sinn Féin. Bloomsbury Publishing. p. 83. ISBN 0-7475-3818-2. Ó Fearghail, Seán Óg (1970). Law (?) and Orders: The Belfast 'Curfew' of 3–5 July 1970. Dundalgan Press. Retrieved 3 July 2011. Hanley, Brian; Millar, Scott (2009). The Lost Revolution: The Story of the Official IRA and the Workers' Party. Dublin: Penguin Ireland. ISBN 1-84488-120-2. English, Richard (2003). Armed Struggle: A History of the IRA. London, UK: MacMillan. ISBN 1-4050-0108-9. Taylor, Peter (1997). Provos: The IRA and Sinn Féin. London, UK: Bloomsbury. ISBN 0-7475-3392-X. Moloney, Ed (2002). The Secret History of the IRA. London, UK: Penguin. ISBN 0-14-101041-X. Mallie, Eamonn; Bishop, Patrick (1988). The Provisional IRA. London, UK: Corgi. ISBN 0-552-13337-X.